His father will stop at nothing at all to keep the royal bloodline “pure” – even murder. But his sins have nearly destroyed Prince Philip and the future of his reign. “I will not lie to you, I will not be unfaithful to you, and I will not love you. My heart is pledged to another, and I am not a man to break an oath.” Lady Rosalynde stares at her groom on the first night of their arranged marriage. He will not love her? Well, she will love him – and she will win his heart. But Prince Philip’s heart appears to be made of ice. Rosalynde could not possibly know of the festering wound on her husband’s soul…how deeply he struggles with the circumstances of his first wife’s death. Or what King Robert has done to his own son in trying to preserve the crown. In ruthless pursuit of the throne, Philip’s cousin penetrates the defenses of the castle and captures King Robert. Philip rallies his army, preparing to fight to the end for his throne. But the battle within is greater. he knows he cannot hold his kingdom without divine aid. Yet he has hardened his heart against God. Against forgiving his father’s unspeakable offenses. And against the unfailing love of Rosalynde. Can Love reach him before the kingdom is torn from his hands? 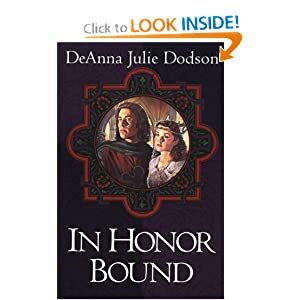 I absolutely loved this novel by DeAnna Julie Dodson! It is one of the best “finds” I’ve discovered in the past two or three years! I heartily recommend this novel to any fan of Historical Christian Fiction! Published by Crossway Books in 1997, you may have to search a little for it, but it is definitely worth the effort! It explores the themes of unconditional love, forgiveness, and romantic love placed within a medieval setting.